You need fresh, original puzzles to captivate your audience. We're the puzzle-writing experts. Here's what we do. We've created a wide variety of puzzles for a wide assortment of needs. Here's a list of some of our clients. Just who are the people behind Puzzability? Think of a six-letter article of clothing. Take the first three-letter chunk and move its middle letter to its end, and you get a three-letter abbreviation often seen at tax time. Then take the last three-letter chunk of the original word and move its middle letter to its front, and you get another three-letter abbreviation often seen at tax time. What are the word and the abbreviations? Check out examples of the kinds of puzzles we can make for you in our Puzzle Sampler. Get Puzzability Crossword Tournament Puzzle Packs! Puzzability and the Bryant Park Reading Room have held a crossword tournament in New York's Bryant Park three times now, in 2016, 2017, and 2018, and all of the puzzles are now available in PDF format. Get the details here. 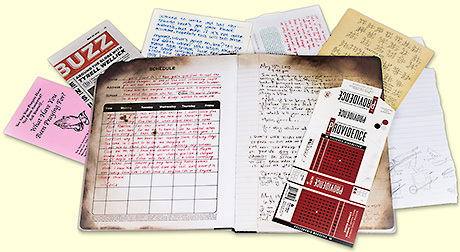 Red Wheelbarrow is the personal notebook of Mr. 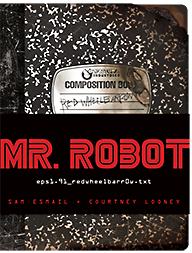 Robot's main character, Elliot Alderson, which can be seen in Season 2 of the show. Puzzability was hired to write hidden puzzles for the book—secret messages that readers can find if they look hard enough. Red Wheelbarrow, the ultimate journey into the world of the show, is available wherever fine slightly singed books are sold. Find out more at the USA Network site here. Puzzability's groundbreaking Project Architeuthis has won 10 awards for its excellence and marketing effectiveness. The code-solving alternate reality game, created to drive awareness of U.S. Navy Cryptology, played out in real time on multiple social media platforms in May 2014. You can read more and find a link to a brief video that captures the nature of the immersive story and puzzles here. © 2018 Puzzability. All rights reserved.